Rattlesnake Facts | Cool Kid Facts . 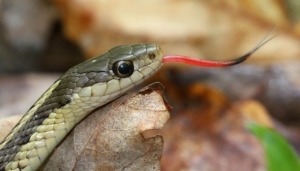 Snakes are, without a doubt, one of the most misunderstood animals on the planet. This is especially true for rattlesnakes, which are viewed as a mean and nasty animal that is to be both feared and destroyed. But the truth of the matter is much different. Read on to find out some cool and interesting rattlesnake facts. Rattlesnakes got their name from their signature rattles at the end of their tails. However, unlike a baby’s rattle, that has little balls inside of it to make that rattling noise, a rattlesnake’s tail is empty. What makes the sound are the different layers of skin that build up on the rattle every time the snake sheds its skin. This, coupled with the snake shaking its tail at a tremendous speed, causes the telltale rattling noise we all know so well. 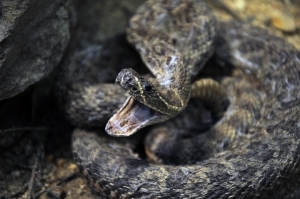 Rattlesnakes rattle to warn predators to steer clear and leave them alone. Contrary to popular belief, rattlesnakes do not want to bite, and would much rather be left alone. That is why they shake their tails, to try and prevent themselves from trying to bite. They will also coil themselves up in an S shape and puff up by taking in extra air. This posture, along with their rattling is meant to scare off anyone who might want to harm them. 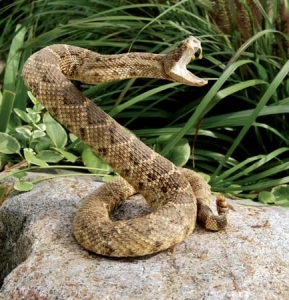 Rattlesnakes are venomous, which means that when they bite they inject venom into their prey using two long fangs. This venom, called hemotoxin, causes damage to the prey’s circulatory system. This can lead to internal bleeding, extreme pain, or tissue damage in humans. However, if a bite is treated in a timely manner, fatalities are not common in people. 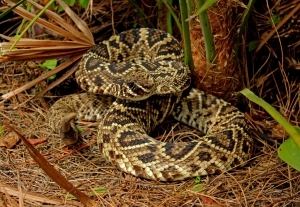 Rattlesnakes range in size depending on the species from one to eight feet in length. They are usually thick bodied snakes and come in a variety of colors and patterns. Most species have some sort of dark diamond shaped patterns on their skin against a lighter colored background. They also have a triangular head. Be Careful of the Babies! Though you might think that baby rattlesnakes are cuter because they are smaller, they are actually more dangerous than adults. For starters, they don’t have rattles, so there will be no warning before they bite you. Secondly, they don’t have good control over their venom yet, which is just as potent as an adults. An adult rattlesnake will use its venom sparingly when they bite, while a young snake will pump you full of venom. 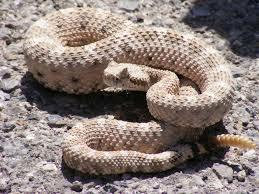 A rattlesnake’s diet consists mostly of small rodents and lizards, depending on the habitat in which they are found. In order to catch their food, they sit in hiding until some prey happens by and then they strike. The venom paralyzes the prey and they swallow it whole. Adult rattlesnakes will only eat once every two weeks. Rattlesnakes are extremely adaptable, and as such can be found in the Northeast, Southeast, and Southwest of the United States. There are over 29 different types of rattlesnakes. However, the three main types are The Timber (Eastern United States) the Eastern Diamondback (Southeastern United States) and the Western Diamondback (Southwestern United States). The Eastern Diamondback is the largest of all, measuring up to lengths of 8 feet.